It’s is National Salsa month! What better way to celebrate than to crinkle the chips and get into the power of the pork rind? Rudolph’s is sharing some of our favorite salsa recipes that pair well with America’s favorite rind. Skinny Dipping has never been easier. With zero carbs, 9 grams of protein, and only 5 grams of fat, why didn’t you kick the chips to the curb earlier? Get ready for some serious salsa slamming! Super Strawberry: It’s the time of the year when strawberries are starting to come into season. Let’s use this bounty to make a simple, tasty salsa that will leave the bowl you make it in empty! shewearsmanyhats.com has an easy recipe that has become a Rudolph’s family addiction. Replace the Cinnamon Sugar Pita Chips with Cinnamon Sugar Rudolph’s Pork Rinds and you’ll be just as crazed as we are. Cowboy Dip: Whether you’re on a cattle drive or commuter drive, this is the perfect salsa recipe to dip Rudolph’s Original Pork Rinds when the day is done. Saddle up with this easy recipe … Yippee-ki-yay! Mango Bango Salsa: Your mouth will do the tango with this fresh mango salsa recipe. Hey, mon … when you dip ’em with Rudolph’s Chile Lime Pork Rinds you bring the flavor of the islands to any party. National Salsa Month is a great time to experiment with flavor and combinations of fruits, veggies and herbs- just don’t forget the rinds. There really is a difference Rudolph’s provides when it comes to scooping up the yum. 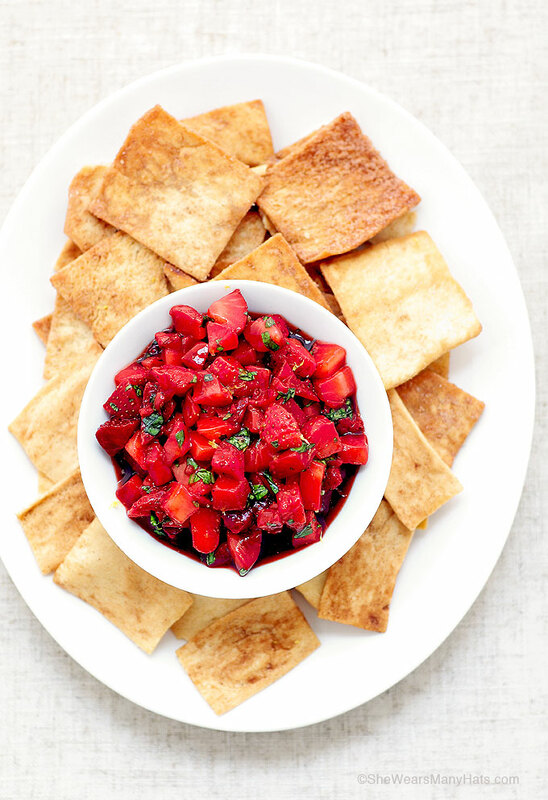 Check out some more of salsa recipes on our Pinterest. Pork rinds are our family tradition. Since 1955, satisfying millions of taste buds across America has been our mission. We do it with pride, integrity and ingenuity. What we’re really proud of is how many others have made Rudolph’s part of their family traditions. Whether we’re part of the July 4th BBQ, camping trip, or just the go-to snack in the cupboard, we’re thankful that our family is a part of yours. And just as amazing is how you use our pork rinds. These top three traditional family recipes just blow us away. Breadings– Our gluten-free, pork rinds are the perfect way to bread or add a crust to an entrée. We especially love this chicken wing recipe from the Food Republic. Pizza Crust– Pork Rind Pizza Crust isn’t just a fad, it’s becoming a way of life for families. There are tons of great recipes out there, but we love the ease and taste of this one from Food.com. Casseroles– There’s nothing that says family and tradition like a casserole! Gather round the table with this interesting take on the great America family meal from Cooks.com. 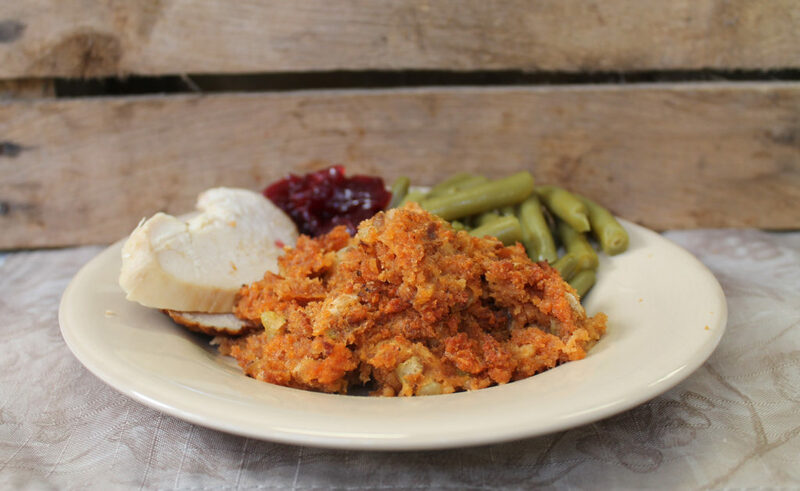 For more recipes sure to become apart of your family tradition, join us here. Thanks for making our family part of yours! Tomorrow is National Chips and Dip Day and we’re putting a twist on this classic combination by … you guessed it, ditching the chips. This ultimate dip recipe from Damn Delicious will have you wondering why there isn’t a rind and dip day! February is National Snack Food Month and we’re celebrating by taking our favorite snack (pork rinds of course!) to the next level! So, go ahead and grab a bag of Southern Recipe rinds because it’s time to step up your snacking! Pork Rind Nachos: Add a tasty twist to a traditional nacho recipe by swapping out corn chips for Southern Recipe pork rinds. Layer on your favorite toppings for a tasty snack with some massive crunch! Jalapeno Poppers: Jalapeno poppers are a classic snack food. Next time you’re craving this spicy snack, go for a low carb recipe using pork rinds instead of bread crumbs. Southern Recipe Hot and Spicy pork rinds work perfectly in this snack food recipe! Pork Rinds and Queso Dip: You heard us right … pork rinds and queso. 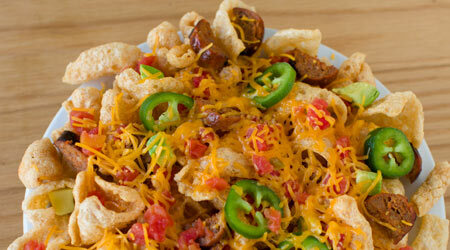 We can’t think of a better combination than Southern Recipe pork rinds and cheesy queso dip. Make this snack even more hearty by adding ground beef to your recipe! Craving more crunch? Check out our Pinterest page for a little inspiration on how to elevate your favorite snacks! If you’re in the same boat as us, you’re in luck! Rudolph’s Pork Rinds have always been a delicious, low carb snack. One serving of our pork rinds has 0 carbs, 9 grams of protein, and only 5 grams of fat. Go ahead and crunch on those numbers! This year, we’re going to help you keep your get fit resolution. 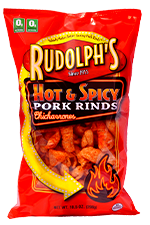 Add some delicious crunch to your recipes with Rudolph’s Pork Rinds. We’ve got some down-home southern specialties that are delicious with our pork rinds, you have to try to believe!